It’s October and it’s time to show off your fall decorating!! My favorite part of my home is our fireplace mantle. 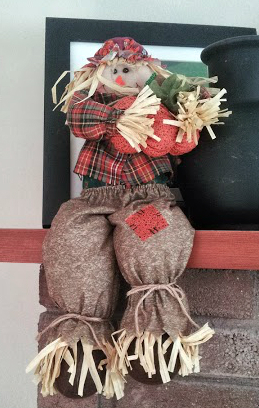 I decorate for fall right after Labor Day. I always decorate in fall decorations instead of just Halloween and just Thanksgiving that way I only have to decorate once until after Thanksgiving when all the Christmas stuff comes out. I have a few Halloween things, but not too many. I love our black cat. 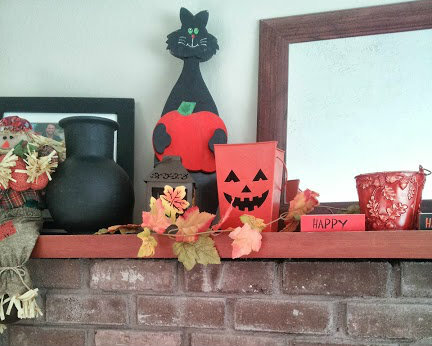 He usually sits down on the steps of the fireplace, but the two year old kept moving him to random places so this year, the black cat went up on the mantle. I think he’s happier here, don’t you think? Mr. and Mrs. Scarecrow are cool. They never move. I wish they would have helped more with the fly problem we’ve had in the house this summer, but there haven’t been any birds, so I guess they are doing their job. I really love this look. I’ve seen the wreath draped over mirrors on several Pinterest boards and loved the look so I opted for the look too and love how it turned out. I also love my “Happy Halloween” blocks–a gift from my daughter who made them for me. 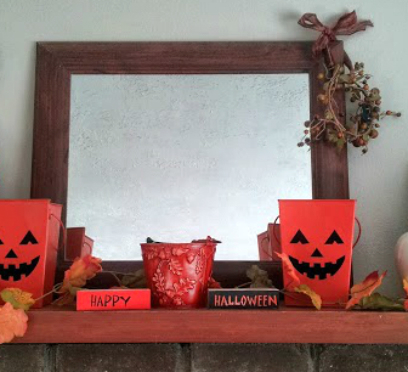 Fall decorating is made beautiful with a few simple decorations. What does your house look like? So cute!! I love decorating for fall but I have a hard time doing it when I still have flowers blooming outside. I pulled up some of my petunias today so I can decorate this weekend between conference sessions. We’re headed to the pumpkin patch too. Have you and your kiddos been yet?